Apples used in this cider hail from Westnorth Manor Farm in Duloe, Cornwall, which forms part of the Duchy of Cornwall estate. Their gold cider is sparkling, light and refreshing. This cider is made up of a blend of bittersweet and dessert apples to create a classic cider flavour and a long, crisp finish. Taste the nature. 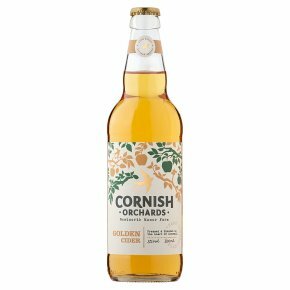 Suitable for vegans.This immensely refreshing cider has a light sparkle with fruity apple tones and a long-dry finish. The creative blend of bittersweet and dessert apples impart this classic cider with body and crispness.